Nintendo has tried its hands in many things. Some of its attempts at F2P were pretty cool. We got Rusty's Real Deal Baseball and Steel Diver: Sub Wars. While the former required to buy each individual game, you could haggle in-game and just buy the ones you thought were interesting. The latter gave everyone an awesome Strategic First Person Shooter with the full purchase granting more single-player content and more access to subs and crew. However, I never felt as if I needed to purchase the full title to really enjoy the game. Pokémon Shuffle can be thought of similarly, but it does require a different mindset. 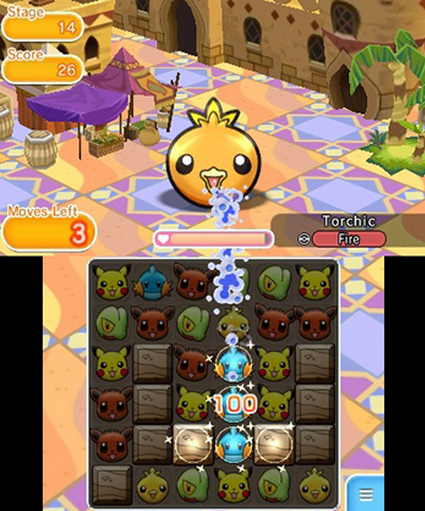 Pokémon Shuffle for the 3DS is a variation of the match-3 gameplay that was popular facebook and then smartphones. The "twist" is that you match three or more of the same Pokémon to unleash an attack against another. Once you defeat a Pokémon , you have a chance to capture it and then use it in your team. Many Pokémon traits carry over from the main games, such as elemental weakness, leveling up, and Mega Evolution. I still even feel the need to continually tap the screen or A while trying to catch a Pokémon . However, the limiting factor the Pokémon Company has placed on the game is the heart limit which in turn determines your play time per session. You start off with 5 hearts and each stage you play requires you to use one. Once you use the first heart, a 30 minute timer counts down to replenish that heart. However, you can only recover one heart per 30 minutes. In my initial playtime, a match can take an average of 1-2 minutes, longer as you progress, so you have to wait 2 hours and a half just for about 10-30 minutes of gameplay. Either that, or you can spend some jewels to replenish your hearts. 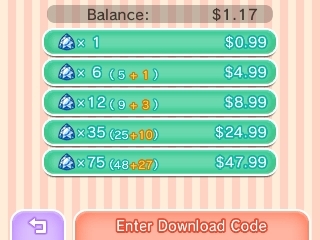 If you run out of jewels, then you can actually purchase more from the eshop, with a limit of 150. Another way you can obtain jewels is to streetpass with other people who own the game. If you defeat a trainer for the first time, you receive another jewel. There is also a "Check In" feature that can grant you some items but you can only do it once per 24 hours. To be honest, I saved 10 out of the 12 jewels the game gives you within the first 150 stages. You can beat the game without them. When you do battle, you are given only a certain number of moves to defeat a Pokémon . Some Pokémon like Eevee will grant you 15, others like Torchic only give you 5 moves to win. However, if you plan your moves right and if you are super lucky, you can pull off a large enough combo to win within a couple of moves. If you run out of moves during a fight, then the game will ever-so-kindly ask if you would like to spend a jewel for five more turns. It's easy at first to dismiss the game as exceedingly simple but I've found a few layers of complexity and strategy hidden beneath those smiling faces of monsters. In addition to the move restriction, different Pokémon will use various disruptions to make your game more difficult. One disruption freezes an icon in place while another replaces Pokémon with blocks or even other Pokémon . Now more Pokémon might sound good, but this game is actually where having less Pokémon is better, hence the Complexity -1 item costs 9000 coins. I certainly needed it to defeat Mewtwo at the very end. Speaking of items, if you use the in-game currency of coins before a battle, you gain a respective boost whether it be 5 more moves or starting with Mega Evolution. However, that strategizing begins even sooner than that. When you select a stage, you can edit your team to try and take advantage of various weaknesses or abilities. There is handy optimization button which has the same pick a team for you based of power and elemental strengths. I tend to use that a lot, but I also make fine changes to my team from time to time. For example, the optimization button likes me to have Audino for support, but I like to use Kangaskan and try to Mega Evolve him. Eevee is slightly weaker than Audino, but his ability speeds up the Mega Evolution process. On the other hand, if there are only 3 moves, then I might as well use Audino. To add to the challenge, there is an expert mode that has you fight Pokémon under a time limit instead and in that case, spending a jewel at the end grants you only 15 more seconds. If that sounds messed up, I will agree with you. While you could argue that the extra chance gives you a chance to catch that Pokémon , I find it hard to argue that it is worth the equivalent of 5 hearts. It's even worse when you consider the alternative is spend a jewel beforehand, get 3000 coins, buy the extra 10 seconds and you probably also have enough for a great ball to increase the odds of catching that Pokémon . On the bright side, if you do obtain enough jewels, you end up with enough gameplay for a while (12 jewels gives 80 hearts). When looking at the cost, that's about $9 when you buy the package set, roughly the cost of a fully downloaded title like Pokémon Battle Trozei. To be honest, I probably would buy that game before buying so many jewels for this title. 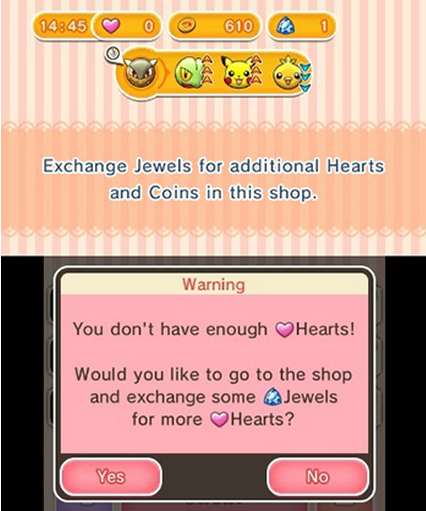 At least streetpass in combination with the Nintendo Zone gives another way to obtain jewels, I just think they could have at least made you start with 7 hearts instead of 5 since starting with 10 would probably mean no one would ever buy the jewels. If you do need a reason to connect online, I would say the main reason would be the 500 coin bonus and the special events. For example, the "Daily Pokémon" event allows you to capture a different Pokémon once a day. In addition to that, there are competitions often where you can obtain Mega Stones. Another common event is to capture a legendary Pokémon like Mew! I'm curious to see what other special events the Pokémon Company has planned. It's certainly a reason to open the game every day. It might be tempting to try and catch every Pokémon the first time around. My advice is to resist the urge. Great Balls are expensive and that money can afford two helpful items in the hard battles. Save your coins for when you require those items. Also, I count on those missed Pokémon to add replay value after beating the 150 stages. Also, some Pokémon just never get used. After catching Pokémon there was never a good opportunity to use him. There were only 3 more fire types, and by then, I had better Pokémon to use. So how is the best way to enjoy this game? I found watching a TV show and playing during the breaks work nicely. If I feel like waiting the full 2 and a half hours, then I can easily play Monster Hunter 4 Ultimate during that time. Or I can play a stage or two and then go for a quick jog. So the only thing this game is not conducive to for the tightly-budget or more fiscally responsible is long play sessions. On the other hand, it's easy to start up and play for 2 or 5 minutes at a time, meaning it's a good game for small periods of waiting like for your girlfriend to use the bathroom in a mall. Perhaps you'll even get some streetpasses. After all, it's not a horrible game, it's just annoyingly designed as an F2P to try and make money from the impatient. So parents, I highly suggest limiting the online purchasing feature for this game or at least make sure your kids don't have access to a credit card.